Tucked and folded gently away in our kitchen cabinets, thoughtfully pinned to social media accounts, passed in emails between good friends, we save new recipes like a new pair of white socks that we don't want to get dirty. We save them for the day we throw a party. We save them for the day we really learn to cook. We save them for the day we have time to explore. We save them for the day we don't want mac n' cheese. We save them because the photo looks delightful. We save them because we save them. The truth? We are not going make these recipes. Nope, never. It's a cycle of lies. The beer chicken recipe from Uncle John, the paleo perfect breakfast bars recipe from the fabulous blogging site or the roasted miso carrots recipe that beckons us in the too cool cooking magazine are only feeding something other than our bellies, our intentions. But, friends, what if we turned our intentions into action? What if we made the recipes tucked around us? And what if I stopped jabbering my pie hole and starting cooking for 30 days? What would happen if I created "A New Recipe Each Day," challenge? Will I become a better cook? Will I gain a deeper understanding of culture's influence on what and how we eat? Will this trial make a connection with the people around me? More importantly, will my children stop saying "Oh, barf!" when I serve them meals? Well, for the next 30 days, I'll be making a new recipe each and every day. It doesn't matter if it's delicious, the prep time is insane or my family hates what is served. The only rule: make a new recipe each and every day for 30 days. Place the oats, brown sugar, cinnamon, salt, sunflower seeds and cherries in a large bowl and stir to combine; set aside. Spread the mixture in a thin, even layer on a rimmed baking sheet. 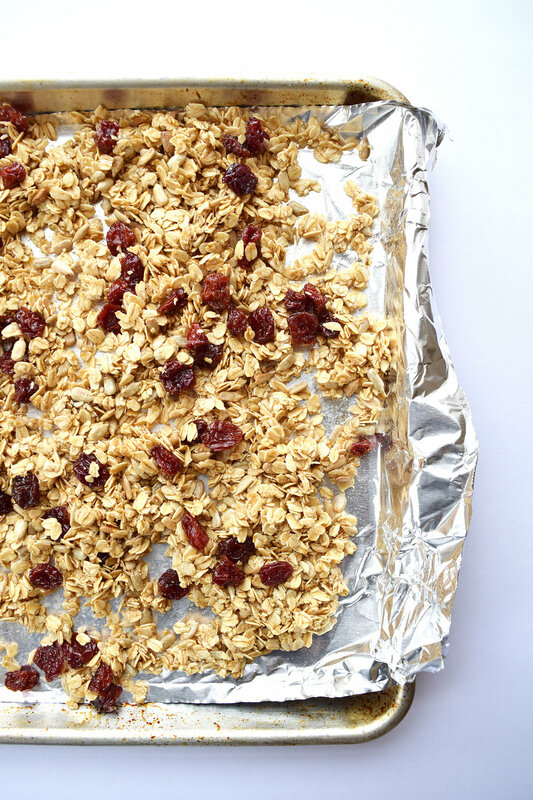 Bake for 15 minutes, then stir and continue baking until the granola is very light golden brown, about 5 to 10 minutes more. Add the chocolate chips to the baking sheet and toss to combine. Store the granola in an airtight container for up to 1 week. Come on! Follow along with your voyeuristic intentions, send me a copy of a recipe that is calling to you and let's sit down and cook something up together. Will the next 30 days be a recipe for disaster or a recipe for happiness? By the way, the verdict on the Homemade Granola recipe is a resounding thumbs-up but I did get a thumbs-down for using stale sunflower seeds.